Bone loss in the jaw can stem from many different causes. Sometimes bone loss can occur due to a progressive or degenerative disease. Often oral trauma or infection can lead to bone loss. Probably the most frequent cause is the loss of a tooth that never gets replaced. When a tooth is lost and not replaced a series of events typically occur that ultimately lead to bone loss. Your jawbone receives constant feedback and stimulation from teeth acting on each other. The act of chewing stimulates the jawbone to stay fit and healthy. If that stimulation is removed (when a tooth is lost and not replaced) the jawbone ceases to be stimulated. This can very easily lead to bone loss in that area of the jaw. The place where this loss is most pronounced is the upper jaw. While you may not lose more bone in that area, the effects of bone loss in the upper jaw are easier to detect in the changes that occur to your facial structure. Your smile ends up changing significantly. All lower teeth in place. When the bone recedes the gums can have a tendency to fill the void. What ends up happening in advanced stages of periodontal disease is teeth are just barely supported by the bone and are mostly supported by each other. The gums that have grown in to the void left by the receding bone make up most of what supports the teeth. The result is teeth that are not solidly supported. Teeth that are not supported by the jaw bone will be loose and unstable. What role do dental implants play? 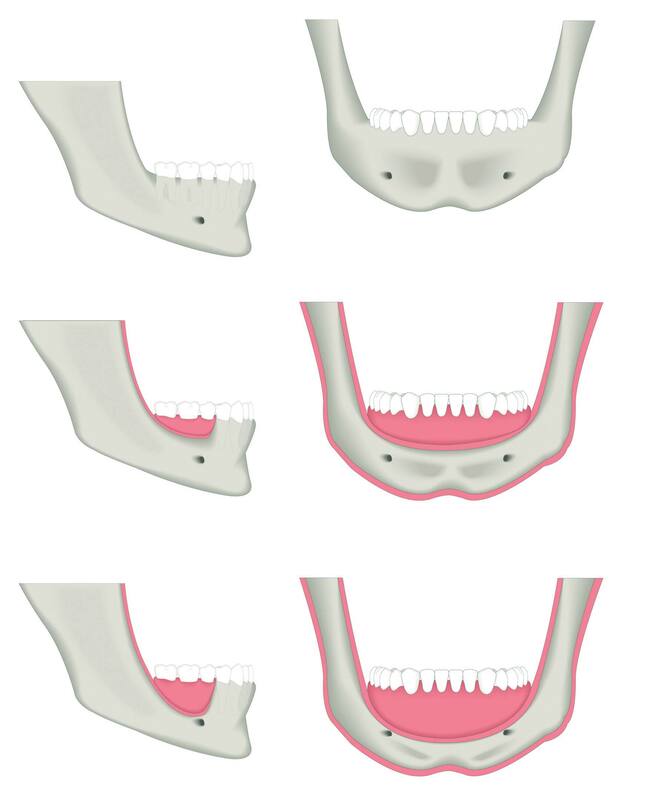 Before a dental implant can be installed adequate bone structure must be present in the jaw. If significant bone loss has already occurred dental implants aren’t really a viable option. Any defects in the bone in the mouth must be fixed before the placement of dental implants. That means any changes in the contour of your mouth that have taken place due to the loss of bone structure would have to be fixed by a bone graft in order to receive an implant. The good news is that we have a solution – bone grafts. The goal of a bone graft is to encourage the body to rebuild the bone structure that attaches the tooth to the jaw. Fortunately, many times while we are performing a bone graft we can also place dental implants. Together, the implant and the bone graft will heal and fuse with your jawbone producing satisfactory results. Commonly used bone grafting materials include: your bone, cadaver bone, cow bone, and synthetic glasses. Different situations call for the use of different materials. After the procedure is finished the graft is covered with a barrier that allows the tissue to heal. The recovery time for a bone graft can take anywhere from six to nine months. During recovery the body melds with the graft, and includes it into the healthy structure of your mouth. Your gums heal over the bone and your mouth returns to normal. After the procedure is finished it is common for you to be prescribed pain medication. It is important to follow any doctor instructions that come with such medications to ensure a successful return to health. Keeping the surgery area clean is imperative to your successful recovery as infections are not unheard of. Brushing and flossing the rest of your mouth normally is encouraged and rinsing your mouth out with water after meals helps quite a bit. Frequently you will be prescribed a mouth rinse containing chlorhexidine, which does a good job of keeping the site clean and free of infection. Swelling is to be expected and can be treated by applying a cold compress to your cheek or chin. There are a number of different bone grafting procedures available, usually depending on the type of bone defect and the size of the graft needed. If you have been affected by periodontal issues and believe you would be a good candidate for a bone graft please give us a call at (623) 584-0664 today. The consultation with Dr. Davis comes with no obligation. We care about your dental health and want to make sure that you know all options available to you so that you can make an informed decision on the future of your smile.